Does A.M. Bickford CALIBRATE Riken Anesthetic Gas Analyzers? We calibrate 1806H 1802D FI-21 & FI-8000P. CLICK HERE to receive quote. What is INCLUDED with the FI-8000P? How long is the FI-8000P WARRANTY? How much does the FI-8000P WEIGH? What are the FI-8000P DIMENSIONS? What SIZE BATTERIES does the FI-8000P use? Can I TURN OFF the FI-8000P AUTOMATIC PUMP? NO, THE PUMP WILL CONTINUOUSLY RUN WHILE THE UNIT IS ON. Can I TURN OFF the FI-8000P "BEEPING"? The LCD Screen (FI-21 & FI-8000P) is displaying Low Contrast, Low Brightness or ERROR message? WHAT SHOULD I DO? HOW MANY Data Recording Points can the FI-8000P STORE? 256 POINTS CAN BE RECORDED. IF THE MAXIMUM IS EXCEEDED THE LCD SCREEN WILL DISPLAY "RECORD FULL"
How do I SWITCH from ONE ANESTHETIC GAS TO ANOTHER? The FI-8000P must be turned off to and turned back one to switch from one agent to another. Press and hold down "POWER/ENTER" button for 3 BEEPS. The unit and pump will turn off. Press and hold down "REF/CAL" and "POWER/ENTER" button at the same time for one beep. The LCD screen will display "SET UP MODE -1- SELECT GAS". Does A.M. Bickford, Inc CALIBRATE the FI-8000P? we provide calibration services for all Riken Anesthetic Gas Analyzers. Inspect your esophageal stethoscope tubes before use to be sure that the membrane covering on the distal end is secure and there are no punctures. A symptom of a bad sensor unit is loss of sensitivity, resulting in having to use high or full gain control. The 4 “C” size flashlight cells will normally power your APM for many months, perhaps close to a year, depending on amount of use and the freshness of the batteries when installed. If the batteries are allowed to reach an advanced state of decay, the APM may give erratic or unreliable performance. To avoid this possibility, the APM has a reliable method of testing the battery condition. This is accomplished by switching to the Mode 2 function and noting whether the audible beeper sound is heard in response to an input signal with the gain control in full high position. Absence of an audible beeper sound in the Mode 2 function, indicates the end of the useful battery life. Replace the batteries and note that normal operation is restored. It is recommended that the above battery check be routine procedure before using the APM. When experiencing a problem with the operation of the unit, please contact our service department via our toll free number or email customerservice@ambickford.com. Please have the Serial Number and the approximate purchase date to aid us in assisting you. If the equipment needs to be sent in for repair, it is given priority status, repaired and returned in as little time as possible. Please be sure to have complete bill to/ship to information (including a contact name and phone number), along with a description of the problem experienced, inside the box and ship the item to A.M. Bickford, Inc., Attn: APM Repair Dept., 12318 Big Tree Rd., Wales Center, NY 14169. There is a free loaner unit when available for units that are being repaired. Upon the return of your equipment, the loaner unit must be returned within 7 days or there will be a charge for rental of the loaner. Shipping costs of the loaner will be charged to the customer. When experiencing a problem with the operation of the unit, please contact our service department via our toll free number 1-800-795-3062 or email sales@ambickford.com. 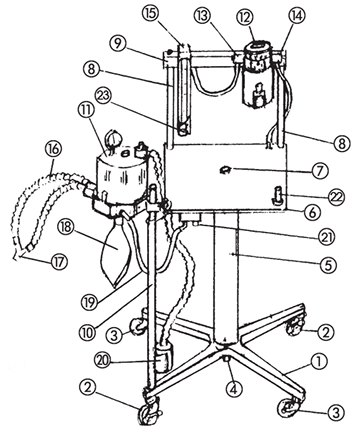 To assist a customer in describing perceived malfunctions in the anesthesia machine, see “Anesthesia Machine and SuperSorber Parts Diagram”. In some cases, assistance can be given on the phone. If this is not the case, then an instrument may be sent in for repair. Please have the Serial Number and the approximate purchase date to aid us in assisting you. If the equipment needs to be sent in for repair, it is given priority status, repaired and returned in as little time as possible. Please be sure to have complete bill to/ship to information (including a contact name and phone number), along with a description of the problem experienced, inside the box and ship the item to A.M. Bickford, Inc., Attn: Repair Dept., 12318 Big Tree Rd., Wales Center, NY 14169. A.M. Bickford, Inc. realizes the importance of customers’ anesthesia equipment to the operation of their practice and the health of their patients. Equipment received for repair, is given priority status, repaired and returned in as little time as possible. When a repair is being sent in, it is extremely helpful if we are notified via our toll free number about the problem so we can be alerted and prepared. 12. 60010 Pressure gauge Pos./Neg. How do I perform a leak test of my anesthesia machine? 1. 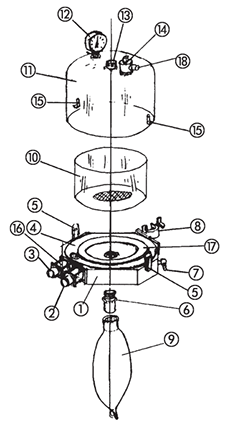 The high pressure system: from the flowmeter input back through the gas supply. With the flowmeter needle valve turned off, turn on the gas supply for O2 and check connections by applying soap suds to each and observing for signs of bubbles. If N2O is present, turn off the O2 and bleed off the O2 pressure, then turn on the N2O supply and check N2O connections in the same manner. In the event that leakage is observed, tighten the connection. 2. The low pressure system: from the flowmeter through the vaporizer, to the CO2 Absorber and patient connections. With the vaporizer turned off, the pop-off valve closed, and the patient connection occluded (by holding a thumb over the “Y” patient end), turn on the O2 flowmeter and observe the pressure gauge on the absorber. Then a pressure of 40mm Hg is reached, turn off the flowmeter and see that the pressure holds for several minutes. If leakage is suspected, apply soap suds to locate the leak. How do I send my SuperSober absorber in for service? We understand your time is important and everyone works differently. That is why we provide our customers different ways to schedule the service. 1. Please have your serial number ready and call: 1-800-795-3062. Does A.M. Bickford provide a SuperSorber Loaner? How often should I have my Vapomatic Vaporizer serviced? We recommend Vapomatic Vaporizers are calibrated annually by A.M. Bickford trained technician. Click Here to schedule service and loaner. How do I send in my Vapomatic Vaporizer in for service? Does A.M. Bickford provide a Vapomatic Vaporizer Loaner? Make sure or ensure Vapomatic Vaporizer is upright at all times. Ensure vaporizer is turned off when not in use. Do not fill Vaporizer with any agent other than the one specified on front cover. Vaporizer is designed for that agent only. Use of any agent other than the one specified can be dangerous to patient. Do not fill vaporizer unless control knob is in “off” position. Do not turn dial “on” during filling. Do not drain the agent into any container other than a properly marked container. Remove filler knob to reveal drain screw. Using a flathead screwdriver and while holding agent specific bottle under filler block, turn drain screw counter clockwise to drain. Retighten drain screw clockwise. Properly discard container for disposal. Ensure that dial is in “off” position. Remove the filler knob by turning it counter clockwise. Verify the agent to be used is the same as that specified on front cover of vaporizer. Pour agent slowly on drain screw. When ¾ full on sight window, vaporizer is full. Replace filler knob by turning clockwise. To prevent leakage, ensure that the filler knob is fully tightened. NOTE: If vaporizer was dry before filling, level will decrease slightly as wicks absorb the agent.